A powerful instrument designed to promote wellness, emotional awakening. Bring Spiritual Power into your life, clinic or office. Use the Professional One Force, and you feel a profound shift at the very core of your being. The One Force is a universal source of wellness, goodness, wholeness and holiness. The patent-pending One Force Technology interacts light from a tiny light bulb with precision-made high tech components to produce an invisible spiritual force. God provided vital design guidance and told an engineer to place this transformation tool on the market. 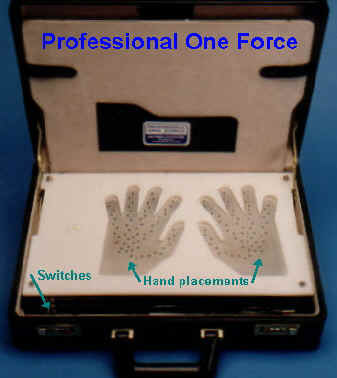 The Professional unit uses both hands to distribute this Universal One Force through the whole body! The One Force goes into all 10 fingers and both palms at the same time. The whole body effect produces quick transforming changes with a typical use time of 15 minutes. The Professional model creates about 50 times as much of the Universal One Force as the personal model. In addition, only the Professional One Force can affect the whole body at the same time! The results are amazing and profound! The Professional unit acts under a divine intelligence that knows your most serious problem areas and acts on them first. People are amazed when they can actually feel it working in all their known problem areas! The Professional unit offers you a chance to glimpse into your spirit. Suspended in space and time, your body is calm and your spirit emerges from within. You feel your spirit radiate from your physical being as a tingling feeling spreads through your soul. Intense feelings of relaxation and contentedness wash over your body. As you drift deeper into a trance-like meditative state, your mind, body and aura cleanse themselves of all impurities, restoring peace and balance to your life. Afterward you continue to resonate with blissful tranquility and wholeness. It's an unusual day. Like a helium balloon ascending in the air, you feel release of your earthly bounds. It can revise "10 tons" of errors. Gazing back down at the everyday world below with your new centered viewpoint, you feel at one with the universe and more certain of your life's path. The Professional One Force reaches to the very core of your self, washing anew each part in your body. The One Force goes into all problem areas on all levels. You experience a deep sensation of revitalization and completeness. Also your memory improves and hidden abilities are reawakened. The Professional model covers you with the blanket of serenity. Peaceful, restful sleep comes easily. Travel through sleep in the state of heightened consciousness. You arise in the morning refreshed and rich with invaluable insights. Feel your heart, mind and body also begin to shift. A beautiful symmetry emerges and you feel all the elements of yourself fall into a splendid alignment. Just switch on and place both hands in the indented hand pattern. Operates on built-in rechargeable long-lasting 14-hour battery with built in A.C. charger. The Professional unit is portable with it's own case and carrying handle. The Professional One Force can revolutionize your practice and provide new services and increase your income.